This young Jewish PhD candidate at the University of Chicago has written what I believe is an extremely insightful and timely essay — one that merits the urgent attention and concern of leaders in the fields of politics, religion and academia, not just in America and Europe, but in Israel, as well. Note: Daniel Luban is a doctoral student in political science at the University of Chicago. After Abraham Foxman waded into the “Ground Zero Mosque” controversy, opposing  plans to construct an Islamic community center a few blocks from the World Trade Center site, the Anti-Defamation League chief was assailed by critics who charged that the ADL was giving license to bigotry and betraying its historic mission “to secure justice and fair treatment to all citizens alike.” A week after initially coming out against the mosque, Foxman announced that the ADL was bowing out of the controversy, but the damage to the group’s reputation had been done. The problem for the ADL is that there simply isn’t much anti-Semitism of consequence in the United States these days. While anti-Semitism continues to thrive elsewhere in the world and to molder on the fringes of American society, Jews have by now been fully assimilated into the American ruling class and into the mainstream of American life. A mundane event like the recent wedding of Protestant Chelsea Clinton and Jewish Marc Mezvinsky drove this point home. What was notable was not the question “will she convert?” but how little importance anyone attached to the answer; the former first daughter’s choice between Judaism and Christianity seemed as inconsequential as the choice between Episcopalianism and Presbyterianism would have a few decades ago. At the same time, many of the tropes of classic anti-Semitism have been revived and given new force on the American right. Once again jingoistic politicians and commentators posit a religious conspiracy breeding within Western society, pledging allegiance to an alien power, conspiring with allies at the highest levels of government to overturn the existing order. Because the propagators of these conspiracy theories are not anti-Semitic but militantly pro-Israel, and because their targets are not Jews but Muslims, the ADL and other Jewish groups have had little to say about them. But since the election of President Barack Obama, this Islamophobic discourse has rapidly intensified. It would be a mistake to seek too precise a correspondence between the new Islamophobia and the old anti-Semitism, which differ in some key respects. Jews have never threatened to become a numerical majority, or even a sizable minority, in any European country, so anxiety about Jewish power naturally gravitated toward the myth of the shadowy elite manipulating the majority from behind the scenes. By contrast, anti-Muslim anxiety has focused on the supposed demographic threat posed by Muslims, in which the dusky hordes overwhelm the West by sheer weight of numbers. (“The sons of Allah breed like rats,” as the late Italian journalist Oriana Fallaci put it.) It may be that in many ways this Islamophobia shares more of the tropes of traditional anti-Catholicism than classic anti-Semitism. But if the tropes do not always line up, there is some notable continuity in the players involved. One of the most striking stories of recent years has been the realignment of segments of the European far right behind a form of militant support for Israel. Much of the traditional neofascist right remains both anti-Muslim and anti-Semitic, but savvier far-right leaders have realized that by dropping the anti-Semitic elements of their platforms and doubling down on Islamophobia, they can tap into a new base of support from pro-Israel hawks across the Atlantic. Both the British National Party and the Vlaams Belang in Belgium have gone this route, although it remains questionable whether the move away from anti-Semitism is more than skin-deep. (The Vlaams Belang’s predecessor party, for instance, was disbanded after a controversy  concerning Holocaust-denying statements made by one of its top officials.) 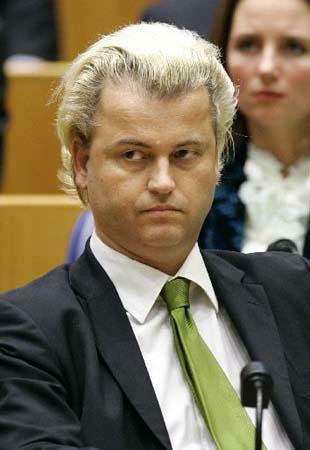 Equally striking has been the rise of Geert Wilders, the controversial Dutch politician whose Islamophobia, virulent enough to draw the condemnation  of even the ADL, has made him a darling of “anti-jihadists” in the United States. Although there was a predictable upsurge in anti-Muslim sentiments in the United States following the Sept. 11 attacks, much of the most virulent Islamophobic discourse remained marginal on this side of the Atlantic in the early years of the war on terror. There are several possible reasons for this, but one of the most important is simply that George W. Bush, as president, was committed to a rhetoric about Islam as a “religion of peace” divided into a moderate majority and an extremist minority. The justification for the Iraq war came to depend heavily on this distinction, and right-wing hawks, with some grumbling, generally fell into line. The election of Obama, however, freed the hawks from any obligation to temper their rhetoric and simultaneously provided ample material for conspiracy theories about Muslims and fellow travelers in the White House. The result has been an intensification both in the amount of Islamophobia and in its political prominence, as ideas that were once marginal have moved to the center of political debate. The two years since Obama’s election have seen a sudden flood of books describing an alleged Muslim conspiracy against the United States. Examples include Robert Spencer’s Stealth Jihad: How Radical Islam Is Subverting America Without Guns Or Bombs, Spencer and Pamela Geller’s new The Post-American Presidency: The Obama Administration’s War On America, Paul Sperry’s Infiltration: How Muslim Spies and Subversives Have Penetrated Washington, and Sperry and P. David Gaubatz’s Muslim Mafia: Inside the Secret Underworld That’s Conspiring to Islamize America. The works share a set of common themes. Radical Muslims who engage in violence are only the tip of the iceberg, goes the argument; the more insidious threat comes from the far larger group of religious Muslims (most, perhaps all) who aim to subjugate the United States under sharia law through ostensibly peaceful and legal means. In this they are aided and abetted by the leftist elites controlling the government, media, and academy—above all, the ambiguously Muslim Obama himself—and a cast of villains that includes some mix of the Muslim Brotherhood, Jeremiah Wright, Saudi Prince Alwaleed bin Talal, the Council on American-Islamic Relations, Obama adviser Dalia Mogahed, ACORN, and George Soros. Some of the authors of these works have ties to the European far right themselves; Geller and Spencer, for instance, have alienated former political allies by championing Geert Wilders and the Vlaams Belang. Andrew C. McCarthy’s The Grand Jihad: How Islam and the Left Sabotage America is among the most recent, and likely the most comprehensive, contributions to the genre. McCarthy is, on the surface, a credible figure: A former federal prosecutor, he came to prominence by winning convictions against Sheikh Omar Abdel-Rahman and others linked to the 1993 World Trade Center bombing. During the Bush years, he was a vociferous defender of the administration’s detainee policies, while Obama’s election caused him to venture into nuttier territory. (He has speculated , for instance, that Bill Ayers may have been the real author of Obama’s Dreams From My Father.) His book helps illustrate both the potency of the Muslim-conspiracy myth and the extent to which it has taken hold of mainstream right-wing discourse. The bulk of the Muslim population, then, aims to impose sharia over every aspect of American life. How will they do this? Through violence, if need be—but McCarthy is keen to note that Islamists are above all master dissimulators who will seek to impose sharia through legal means if they can (“grand-jihad-by-sabotage,” he calls it). This means that even peaceful attempts to follow Islam through strictly private means (for instance, through sharia-compliant finance) are simply precursors to a takeover of the overall system. Muslims who live within religious or ethnic enclaves are not merely trying to remain within a familiar community or preserve shared values; rather, they are presented as deviously following the “voluntary apartheid” strategy of Yusuf al-Qaradawi, ideologue of the Muslim Brotherhood—the group whose “global tentacles” extend into nearly every Muslim-American civil society organization. It is too obvious to be worth belaboring that no one would dream of applying a similar logic to Orthodox Jews or evangelical Christian homeschoolers. The Islamist threat to the United States, McCarthy further argues, would not be so dire if it weren’t for their alliance with the leftists who “dominate policy circles, the academy, and the media.” The most important of these, of course, is Obama himself. Obama “publicly professes” to be a Christian, and McCarthy generously allows that there is no reason to doubt him—although he goes on to include two full chapters on Obama’s Muslim roots—before asserting that the “faith to which Obama actually clings is neocommunism.” This distinction ultimately matters little, however, for the Marxism of Obama and the rest of the American elite coalesces in key respects with the Islamism of the Muslim Brotherhood and its American minions. The overall tone and content of McCarthy’s polemic will be familiar to students of 1850s Know-Nothing anti-Catholicism or 1950s anti-Communism—or, for that matter, late-19th-century European anti-Semitism. It is tempting to dismiss him as a crackpot, and on an obvious level he is one. But his speculations and those of his fellows are far from irrelevant to the political moment. They are not being published in anonymous blog comments sections, but in widely publicized and bestselling books. More to the point, they have already made a notable impact on American political discourse. The mosque furor is only the most recent and revealing demonstration of the anti-jihadists’ political influence; from the beginning of the controversy, McCarthy and his allies have dictated the terms of debate on the right. In his July 28 statement attacking the Islamic center, Newt Gingrich cited The Grand Jihad and framed the controversy in McCarthy’s terms of Western civilization under siege from creeping sharia. More recently, the American Family Association—a leading fundamentalist Christian group—cited the book to argue that no more mosques should be built anywhere in the United States because “each Islamic mosque is dedicated to the overthrow of the American government.” A campaign spearheaded by Pamela Geller, the right-wing blogger who was previously most notorious for publishing a lengthy piece alleging that Obama is the illegitimate child of Malcolm X, will place ads on New York City buses opposing the Islamic center. On September 11, she and Gingrich will lead a major rally against the center that will also feature Wilders, the Islamophobic Dutch politician. What was once a lunatic fringe now appears to be running the show, aided and abetted by mainstream figures like Gingrich. It is quite possible that the next Republican president will also be a party to what can justly be called the new McCarthyism; for that reason alone, McCarthy and his allies deserve our attention. But even more important is the impact of this steady stream of anti-Muslim vitriol on the popular consciousness. Cynical politicians like Gingrich may know that all the talk of the Islamic center as a “9/11 victory monument” and of ordinary Muslims as stealth sharia operatives is mere agitprop designed to win votes in an election year, but ordinary citizens may take them at their word and act accordingly. While activists like Pam Geller have led the anti-mosque campaign and the broader demonization of Muslims that has accompanied it, leaders like Abe Foxman have acquiesced in it. In doing so they risk providing an ugly and ironic illustration of the extent of Jewish assimilation in 21st-century America. We know that Jews can grow up to be senators and Supreme Court justices. Let’s not also discover that they can grow up to incite a pogrom. Daniel Luban is a doctoral student in political science at the University of Chicago.